All The Yankee Ladies: American tennis has been dead to rites time after time, but eventually someone starts putting up results and the narrative changes. While it would be quite early to say an American tennis renaissance is underway, there are unmistakable signs of life from the women's draw. Youngsters Christina McHale, Lauren Davis and Sloane Stephens joined veterans Bethanie Mattek-Sands, Varvara Lepchenko and Vania King in advancing to the second round at Roland Garros today. Rather unexpectedly, there are ten American women (including Alexa Glatch, Melanie Oudin, Irina Falconi and some player named Venus Williams who won yesterday) in the second round of the claycourt major. Oh, plus Serena Williams and Jamie Hampton have yet to take the court. You have to think, somewhere Billie Jean King is grinning ear to ear. What's behind the Parisian push for the Yankee ladies? It's early days, but it seems the oft-maligned USTA Player Development program deserves at least some of the credit. Christina McHale, Varvara Lepchenko and Melanie Oudin have all been training at the Billie Jean King USTA National Tennis Center in New York of late. "My results have all been up after I've been practicing there," said Lepchenko when we spoke in Madrid. "We have a great team, awesome coaches, the atmosphere is very positive, very challenging. There's a lot of young kids, that pushes me a lot because I don't want to be a step slower than them." Lepchenko outlasted Kazakh Ksenia Pervak 6-2, 6-7(8), 6-4 to set a second round date with slumping 19th seed Jelena Jankovic. Venus Williams, King and Lepchenko (ranked 52nd, 56th and 61st respectively) are all in contention for the Team USA's last two Olympics slots (Serena Williams and McHale are presumably guaranteed slots given their rankings). Players must be ranked in the top 56 and among the US' top four. Each player has spoken out about wanting to play for Team USA in interviews, so the competition is fierce. The ranking cutoff comes after Roland Garros so how each woman performs here is likely to set the final squad. While not in the Olympic mix, Sloane Stephens delivered a medal-worthy performance dispatching barely unseeded (38th ranked) Ekaterina Makarova 6-4, 7-6 (6). Makarova reached the quarterfinals of this year's Australian Open beating Serena Williams before eventually falling to Maria Sharapova. Stephens mentioned a friendly rivalry with Mattek-Sands, her second round opponent, when she spoke to Tennis Channel after her match, but was clear that their friendship won't affect either player's competitiveness. "It'll be another battle, like any other....We'll be out there with blood, sweat and tears," said Stephens. "I'm excited, I know she is too." While Stephens trains with the USTA in California, the USTA can't take all the credit for America's banner day, Mattek-Sands has her own team in Arizona and the Williams sisters were famously developed outside of the USTA system. 18 year old Lauren Davis calls Chris Evert's Florida academy homebase. 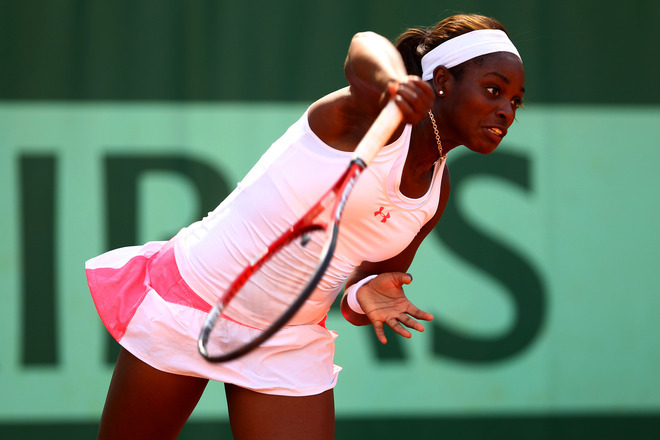 Davis, who came through qualifying, romped past surging 30th seeded German Mona Barthel, 6-1, 6-1. On air with ESPN2 after Davis' win, Evert said of her charge, "I'm still stunned she won." Davis' poise on the court was just as preternatural as her poise on the ESPN2 set. All but obscure moments ago, the was no quiver in her voice, no nervous giggles as she talked to the ESPN2 crew. They replayed her matchpoint and there was no dramatic fall to the terre battue, a handshake for her opponent and the umpire and then on to packing up her gear. We loved it, winning like she's done it before. The American women are taking everyone by surprise at this year's tournament, even those who know them best. A Tale of Two (More) Americans: As strong as this Roland Garros has been for the American women, for American men the results have been decidely mixed. 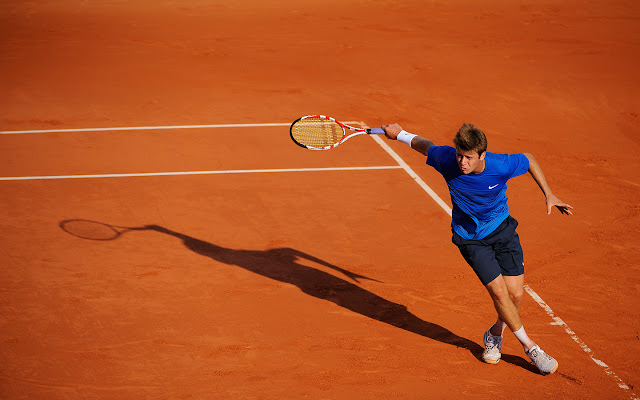 Ryan Harrison was dealt a tricky draw, 11th seeded Gilles Simon in the first round, and a daunting court assignment, the big house, Chatrier, on which to play him. Some look at those circumstances and say tough luck. Our opinion...it's not like the guy drew Nadal...or Djokovic...or Federer. Simon, seemingly not the French crowd's favorite Frenchman, can certainly play on clay. He made the semis in Monte Carlo (l. to Nadal), won the Tiriac trophy (the other one) in Bucharest, fell to Tipsarevic in Madrid and Ferrer in Rome, all "good" losses. That said, he's not a player who could overpower Harrison, or really even outwit him. What Simon did, and what many Harrison opponents have done, was outsteady him. He waited for Harrison's inevitable McEnroe moment and he pounced. To his credit, the young American tried to right himself, scoring early breaks in the 2nd and 3rd sets, but once Simon got his teeth into the match, Harrison was done. In the closing set, Harrison seemed mentally pack up the racquets, delivering 13 unforced errors to just 3 winners. Thus ended Harrison's Roland Garros, by way of a 3-6, 7-5, 6-4, 6-1 loss to Simon. An avoidable loss. If there were two players I'd like to get to sit down for a beer (in France, where Harrison's of legal age, and presumably having one after he digests this loss tonight) or dinner to be totally PC, it's Harrison and Brian Baker. The entire US contingent of TennisWorld has been abuzz over Baker for the last three weeks. First he won the Savannah Challenger, that granted him the USTA reciprocal wildcard into Roland Garros. Then he came to France early to get some red clay matches in Nice. He qualified for the main draw in the 250-level Cote D'Azur tourney and then went on to reach the final (l. to Nicolas Almagro). Then, for good measure, he comes to Roland Garros, where he could be justifiably just be ripe for a fall and dishes out a straight set defeat to veteran Xavier Malisse, 6-3, 7-6 (1), 7-6 (5). Baker's seven year odyssey with injury has been well-documented, so we won't recount it here. The lesson (that we would love for him to share with Harrison) is how precious these chances are. Baker is making the most of every opportunity these days, as he knows he may never have another. The last time Baker played a main draw match at a major, Harrison was 13 years old. Baker, the junior French Open finalist in 2003 watched his junior contemporaries like Stanislas Wawrinka, Tomas Berdych and Novak Djokovic go from strength to strength while Baker waited and prayed for another chance to play the game he loves. We've never met Harrison, but by all accounts, he seems to be a polite, respectful young man, who just gets a bit too much steam coming out of his ears when things aren't going well on court. What's certainly not a question is that he is an immense talent, but until he can start turning these "woulda, shoulda, coulda" matches into wins, that's all he'll ever be. The good news is that switch can be flipped at any time. No greater a champion than Roger Federer once had a penchant for petulant meltdowns himself, though you wouldn't know it by the way he comports himself these days. If Baker's too busy to catch a Kronenbourg with Harrison before he leaves Paris, maybe he can connect with Grandma Azarenka, she seems to have the cure for what ails him. On To The Next One: One of the interesting things about Twitter is that knee jerk reactions abound. It's neither a good, nor a bad thing; it's just a fact that opinions that in times past would have been mediated by distance and editors now come flying at you at breakneck speed en masse. One such set of knee jerk reactions came around three of the world's best players: Roger Federer, Victoria Azarenka and Novak Djokovic today. According to some on Twitter, they were in deep trouble, weren't playing their best tennis, not long for this tournament. Each pulled out victories today to move on to the second round. If you think back to the late 80s, you'll remember the regularity with which players like Steffi Graf used to all but pistolwhip her competition in the early rounds. In her Golden Slam year of 1988, she lost just six games through her first three matches at Roland Garros. The only player to take more than 4 games from her in any match that tournament was longtime rival (and World No. 4) Gabriela Sabatini, whom Graf subdued 6-3, 7-6 (3). All the talk of fields being deeper today, especially among the women, rings true. Azarenka, the World No. 1 dropped a tight first set and two breaks in the second to 32 year old Italian Alberta Brianti before righting the ship. The Bella Belarussian sprayed more than a set's worth of unforced errors in that opening stanza, 28, 39 in the first 12 games, en route to an eye-popping total of 60. Though she did herself precious few favors, gifting Brianti 60 of the 92 points she would win today, Azarenka moved on 6-7(6), 6-4, 6-2. 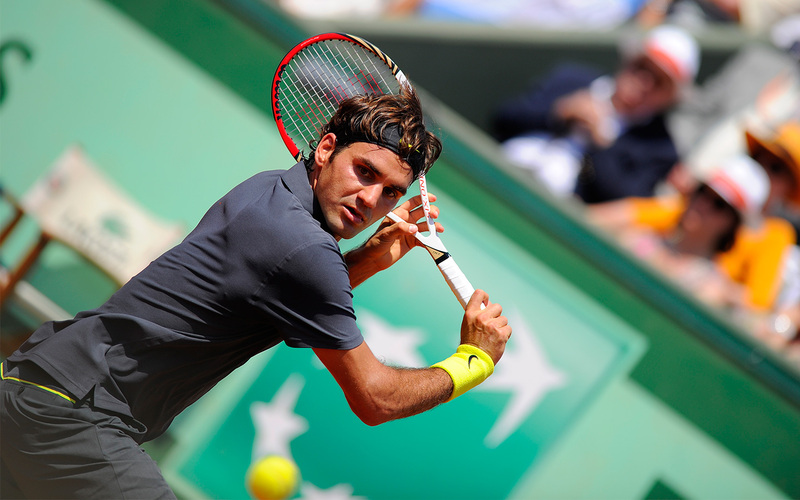 It was a similarly un-tidy early round encounter for Roger Federer. Opening his tournament on the second stadium, Suzanne Lenglen, Federer served only 59% and delivered a surprising 47 unforced errors to 38 winners in his 6-2, 7-5, 6-3 dismissal of German Tobias Kamke. In the big house, aka Court Phillippe Chatrier, it wasn't errors, but an inspired opponent, Potito Starace, that extended Novak Djokovic to a first set breaker before he eventually ousted Starace 7-6 (3), 6-3, 6-1. What do these early round tests of the top seeds mean? Nothing. It's always interesting to see a journeyman (or journeywoman) push the top seeds to raise their level early in the tournament, but do these tough matches mean we shouldn't expect Federer, Azarenka or Djokovic to figure strongly in the second week of the tournament? Hardly. John Isner pushed Rafael Nadal to five sets last year at this stage. I think you remember who carried home the trophy last year, right? Calm down. A quartz watch is simply a digital watch some powered by battery and some take solar source. Quartz hublot replica sale may be the most suitable choice for the people who just want an inexpensive, accurate and reliable Seiko Guys Watch. The main benefit of quartz rolex replica is its low maintenance. The black switch of this hublot replica sale is very easy to read while winning contests. Reproduction watches of various national and international brands are often you can find. These are almost similar in look and other features of original product. Popularity of these watches is due to their availability at lower prices. Products such as fake rolex online are very popular in the market as these products are almost similar in design, performance and features of original item. If you think the popularity of watches have declined because of the many portable digital products on the fake rolex sale today, reconsider that thought because watches are checking up on the ongoing trend while growing in both functionality and style.